Lets be clear and honest, the LEFT has been on the march spewing Hate and Violence for years. If you ignore that fact you're lying. A defiant President Trump on Tuesday angrily condemned “the alt left” for what he said was their role in the weekend unrest in Charlottesville, squarely placing blame on “both sides” for the deadly violence. “What about the alt left that came charging at, as you say, at the alt right? Do they have any guilt? 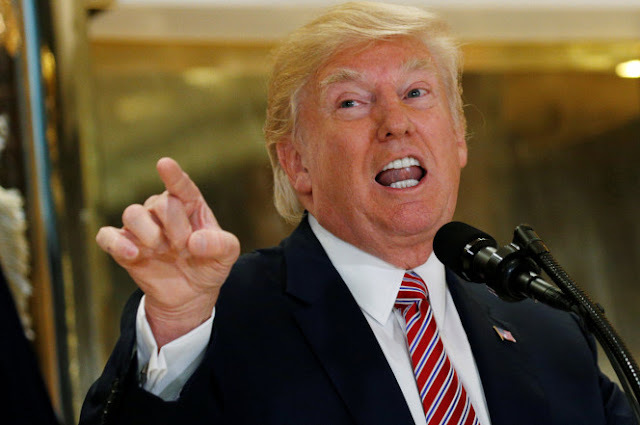 What about the fact that they came charging with clubs in their hands swinging clubs?” a combative Trump said in a remarkable news conference in which he seemed to equate the counter-protesters and the white supremacists. “You had a group on the other side that came charging in without a permit and they were very, very violent,” the president said in remarks that were sure to prolong the debate over his response to the clashes in Virginia. Trump, appearing on the lobby of his signature building to tout his infrastructure plan, quickly found himself on the defensive as reporters fired repeated questions at him. He also dove headfirst into the national debate over the fate of monuments that honor historical figures that have become controversial over time — such as Charlottesville’s statue honoring Confederate General Robert E. Lee. The weekend protests included white nationalists and neo-Nazis who opposed the statue’s planned removal. “George Washington as a slave owner. So will George Washington now lose his status? Are we going to take down statues to George Washington? How about Thomas Jefferson? Are we going to take down his statue? He was a major slave owner,” Trump said. He railed against fake news, called the press dishonest and turned red with rage as he defended his handling of the aftermath — even defending his much-maligned initial remarks from Saturday. “Everybody said [my] statement was beautiful,” the president said, rereading the portion that preceded his insistence that “many sides” were to blame.